We work in both AGILE and ADDIE models depending on how you prefer to implement your learning within your organisation. The AGILE method (Align, Get Set, Iterate & Implement, Leverage, Evaluate) is borne out of software development with the focus on iteration to achieve quality throughout the build, and can be applied to the Instructional Design component where it is an iterative type of design and development. The materials are created and evaluated during the process rather than creating an entire product which is then evaluated - such as the ADDIE model (see below). Align: Align the learning with learners and performers in the organisation, and business strategy and intelligence alignment. It's about accomodating the five moments of learning need. Get Set: Once agreement is achieved on preparing learners to perform and supplying the right information when it's required, Get Set uses rapid task and critical skills analysis. 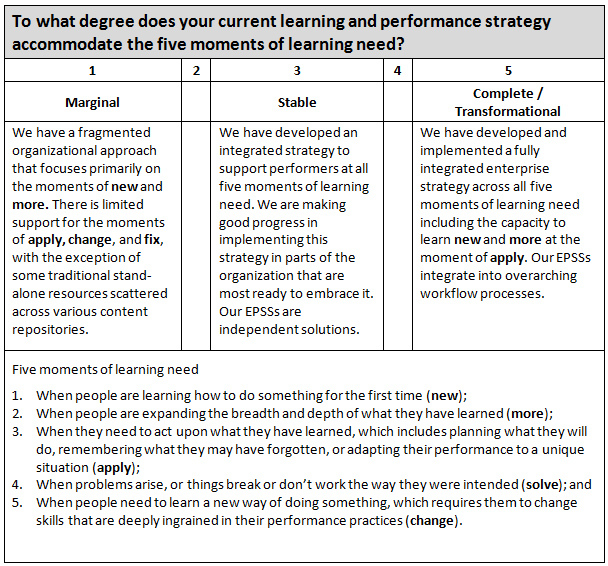 This is all used to create a Learning Experience and Performance plan (LEaP). Iterate and Implement: This is the development stage where it is determined how functionality impacts learners and performance, if any learner or user changes are required, and if there are more new knowledge supporting topics required. This mapped to the existing LEaP. Leverage: Leveraging technology e.g. enabling learners to find the right information when they need it; Leveraging people e.g. allowing teams to use social media and collaborative tools within their company. Evaluate: Evaluate the quality of the learning product and the impact on learners and performance. The ADDIE method (Analyse, Design, Develop, Implement, Evaluate) is where the Instructional Design Consultant can be asked to complete the entire process from the Analysis through to the Evaluation or they can be asked to do just one or two parts of the process. If a client has already determined what they need and defined the objectives then the Instructional Designer can start at the Design phase. On occasions the client wants to develop the product on their own so the Instructional Designer may do just the Design phase. However, a skilled Instructional Designer can carry out the entire process when required. This method is a nonlinear sequence. The process for the desiger has the ability to return to previous phases or jump ahead to latter phases. Example 1:When defining the objectives, you might need to do more analysis. Example 2: When designing, you are always referring back to the objectives. Example 3: If you find an error when you are carrying out the testing, you may need to go back to the design and development phases.